If you need to sort, group, indent, or otherwise format exported data in an Excel worksheet, or create a total under the last row of data, you can write VBA code to use Excel commands to do the work in code. 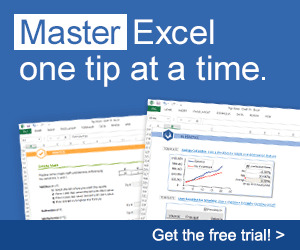 You can apply formatting to a worksheet created by the TransferSpreadsheet method, or one created from the Ribbon command, or a worksheet created programmatically from a template. ¡-77777-pr-™^ See Chapter 7 for examples of creating worksheets using the TransferSpreadsheet I^U&SOgMyJA method. In this section, data from qryOrdersAndDetails is exported to a new worksheet made from a template and is then formatted in code. For convenience, the ExportNorthwindData procedure can be run from the macro mcrExportNorthwindData. 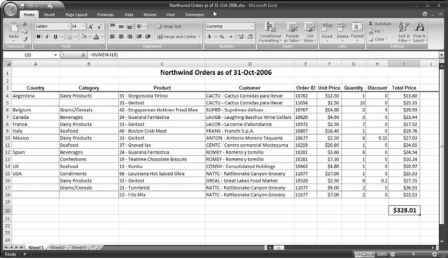 The procedure starts by creating a new worksheet from a template (Northwind Orders.xltx), as for the ArchiveData procedure. Data from the query qryOrdersAndDetails is written to rows in the worksheet, and then a set of Excel commands is used to apply hairline borders to the data area, and a double bottom border to the column headings row. strTitle = "Template not found"
Put up a success message with the name and path of the new worksheet: strTitle = "Workbook created"
A finished worksheet is shown in Figure 3.13. A worksheet filled with data and formatted using VBA code. How to use strsavename in vb excel?